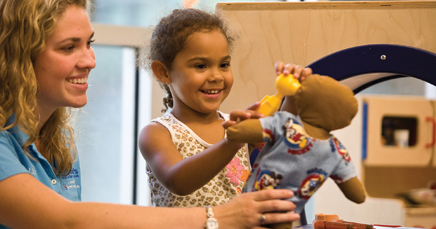 The Child Life Department at Dell Children’s Medical Center is staffed by professionally trained individuals who help to reduce the stress and anxiety that children and their families may encounter as a result of illness, injury and hospitalization. Aiming to create a more positive learning experience, child life staff work closely with the entire health care team on every inpatient unit and in outpatient areas to provide the highest quality care for children of all ages. To contact the child life specialist assigned to various units or clinics in the hospital, or for information about any of these services, please contact the Child Life Department at (512) 324-0146.